In 2019 it’s a crazy world out there, and we all know someone who has had something happen in their lives in the dealings with other people that has left them in a state of shock and amazement. Who knows why people do the things they do, and why there seems to be a general underlying lack of respect for people’s property and personal belongings. We live in a greed-based culture where theft is seen as the norm, so we tend to get caught up doing it to each other I suppose…but this is the wrong mindset. Unfortunately, sometimes we don’t see these people in our lives until it is already too late. And sometimes, we even are foolish enough to rent our properties out to these types of disrespectful people. Is it worth going after the tenant in court? If you want to go after the tenant in court then you will be required to file a summons down at your local county courthouse. Look on their website for more information about where to go, how much the filing fee is, and what documentation to bring. A lot of times you can have a court date scheduled within a few weeks and the defendant will be required to show up by law, and you can plead your case in front of the judge. Pro tip – If the defendant fails to show up then there could be an automatic ruling in your favor, so this can be a good option for some people who want to recover small damages of up to $3000 in civil court. 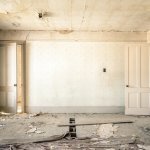 Is it worth it to hire contractors and fix up the property yourself? One little-known option that is actually really helpful is to find a handyman who wants to rent the house. In exchange for a discount on rent (or even, free rent) they can fix up the house for you to make it a nice rental property again. Make sure you have a timeline all spelled out, though, to avoid then staying too long without a lot of work getting done. This option can be a bit risky because then you could end up tying the property up further if things don’t end up working out between you and the contractor…and then you would be in for an entirely new set of problems. Investors are oftentimes willing to buy houses in the Philadelphia market that are in extremely poor condition and will required thousands of dollars worth of renovations before they can be resold back on the open market. Real estate investors are cash buyers who will buy homes in the city of Philly without having to go through a third party lender. Lenders can complicate transactions because they have a very strict set of requirements that need to be in place before they will fund the deal. Investors have no requirements, and will buy homes that are in bad condition with cash in a matter of a few days in certain cases. At Rapid Home Liquidation we will buy any house fast in the Delaware Valley, no matter what condition its in or what type of repairs are needed. As a matter of fact, we are actually searching for homes that need a lot of work and are in poor condition. Our team specializes in buying junk houses that are in dilapidated, run-down condition because we are professional contractors and we work with local material supply companies and can get materials for much cheaper than our competitors. To get a fair cash offer for your property, no matter what condition it’s in, just get in touch with us and we’ll give you a no-obligation offer and we can even buy your property from you fast. Click here now and fill out the form or call our office at (215) 882-9828 and we’ll get back to you right away.